The name of the game is 'Seven Voyages of Zylarthen'. So why did I instantly like 'Seven Voyages of Zylarthen' and decide to go with it? The other names sucked for my eventual purpose. 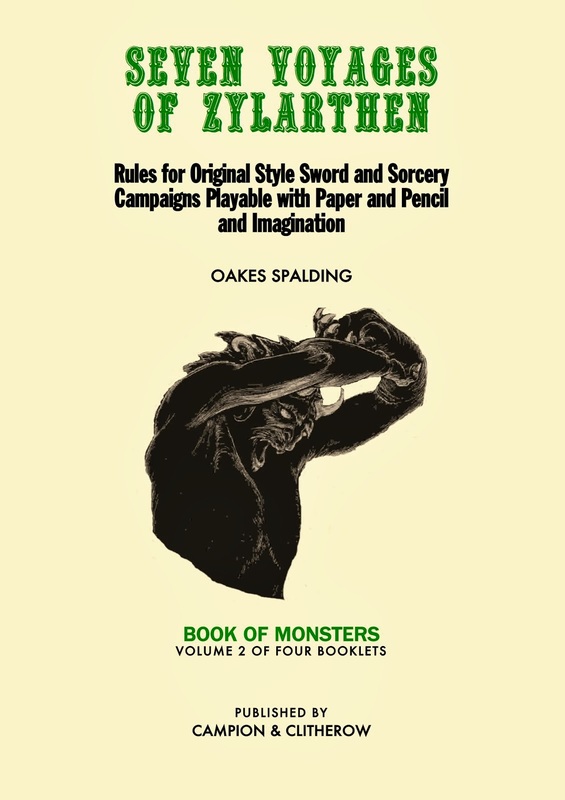 It was a tribute to the first named character in OD&D--Xylarthen, the character who 'would have progressed faster as a Cleric, but because of a personal preference for magic, opted for that class' Men & Magic, p. 10. At least one other author riffed on this character--Jeff Rients in his neat convention module, Under Xylarthen's Tower (never offered commercially). I was feeling so righteous at that time that I considered naming the game using the actual name with the 'X' and everything. Sue me WOTC! Then I saw reason (and morality and legality) and decided I had to modify it. I'm glad I did. It was different. It hopefully made the game stand out from the pack. It was alternately memorable and hard to remember, if that makes sense. Along with the 'Seven Voyages' it referenced Aladdin and the tone of sort of fairytale wonder that I was going for, and that the illustrations by John Dickson Batten (perhaps the best thing about my humble effort) promoted. Why am I now even more happy with it? It's memorable or at least gets people talking about how to say it or pronounce it. But now the question is, how do you abbreviate it? 'Withdraw it from circulation. I'm a 5E man' or 'Withdraw it from circulation, clones are so 2009' etc. So, here's the contest. Comment on my blog as to your preference. I can't say I'll listen if 6. wins, but I will applaud you for your opinion in the spirit of openness and tolerance. They must be on my blog. Not merely Google+. If I get 50 comments or votes, I'll send a free set of Seven Voyages of Zylarthen hardcopy booklets out to a randomly selected entrant. If you already have it, I'll send you the the hardcopy Lulu version of Stonehell, Swords & Wizardry Whitebox or Anomalous Subsurface Environment. Full disclosure: I've never received 50+ comments on my blog. I've gotten 20+ a number of times in reference to the mathematics of Orc evolution or monotheism, etc. But never 50+. So, it's perhaps a tall order, but I'm serious about it. 50+ votes or bust. Hey, I'm risking major embarrassment here if I only get 2 comments. Let's give it, say a week. May the best abbreviation win! Cheers and thank you in advance. I would prefer 7 voyages or simply 7v. Looks cool! Seven Voyages sounds cool even if it's a bit long. Definitely, 'Seven Voyages'. It encapsulates that whole, ' Standing on the helm of a ship, going hither'. PS, if ANYONE makes a Titanic reference, I WILL find you ;) All jokes aside, you get the Greek Iliad;Odyssey feeling, not to mention Sindbad etc. I'm probably in the 7VoZ camp, myself, for abbreviating the name. But, when talking to people, I "Abbreviate" it in the spoken word as 'Seven Voyages". Much like Alasdair, above, it just *sounds* fun saying it outloud to someone! I prefer simply Voyages. Seven Voyages is nice and all, but I feel it would be too easily confused with Aladdin and I think that would be bad. 7VoZ (Seven-Voz) or SVoZ (Ess-Voz) would suit RPG fandom naming conventions. I'd opt for the SVoZ as it sticks to capitalizing the letters of the important words of the title and makes it quicker to say, and you don't use the numeral in the title so why use it in the abbreviation? I'd skip Seven Voyages as it's more a reference for Sinbad. Zylarthen is OK, but geeks love abbrev. Jargon so I think SVoZ would work better. I like Zylarthen, because it emphasises the element of the name that is particular to the game. My second choice would be 7VoZ. I like 7VoZ but overall I think I agree SVoZ fits in with naming conventions better. So I'm throwing my money behind 'SVoZ'. Zylarthen is unique and has almost all the upsides you spoke of, without being a gimmicky abbreviation. SVoZ (ess-vahz) was in my head since the first time I read it! And I think 'Seven Voyages' is a nice in-between' the abbreviation and the full name. I love the full name, but when I think of it I think "Seven Voyages." However, I like SVoZ as a print abbreviation, too. You said it yourself: your product is the only one that turns up in Google. Seven Voyages makes me think of Sinbad (not a bad thing, but not your thing). I usually call it Zylarthen, Acronym-wise I'd second Durand Durand's SVoZ; works better than the numeral. It's probably good to have a proper name and then a discussion-friendly acronym. I stuff the ballot box with two votes, then! Had you done Zylarthen & The 7 Voyages, we could do something like Z&SV (or Z&V) to get that famous & involved. I'd go either Seven Voyages or SVoZ for print. I tend to use the first few words of a product for conversations. I like the first letters for print stuff, reviews, supplements, etc. SVoZ if that was an option, 7VoZ if not. I've found with another game that I use one abbreviation in writing and another in conversation. So I'd be likely to write out SVoZ, but say Zylarthen. If I'm writing it out, I've been writing/typing 7VoZ, but usually when speaking say at least Seven Voyages. All of my campaign notes for my hex creations I've been marking books that I rolled in, so most of my hexes have nice 7VoZ notes next to them. 7VoZ - in speaking, pronounce "Seven Voz". If the listener doesn't understand, consider it a teaching moment. I like Zylarthen as a verbal abbreviation and perhaps when a word would look better than an acronym. But for a quick, short acronym I'd go with 7VoZ or SVoZ (though 7v looks neat). My first thought was 7VZ. Easy to say and write. It's also easily distinguishable from the the other retroclones that way, at first glance. Sevvoy is not an option? Ah well then Seven Voyages would be my next choice. Personally, I really like the idea of "SVZ." Saying "Ess Vee Zee" rolls easily off the tongue. 7VoZ is the best abbreviation. Seven Voyages, as romantic as it sounds, is not as specific. In speech, I prefer "Seven Voyages." Written, I prefer 7VoZ. I like Zylarthen. It has a nice "Greyhawkish" sound to it. The voyages part makes it sound like a sailing game. I have been referring to it either as Zylarthen or SEVEN. My vote goes for Other - SEVEN, just to be different. Strip the 'o'. I rather like the even more truncated, '7VZ' or seven-vee-zee in conversation. I like "Seven Voyages" and "Zylarthen" in equal measure. But, if I must choose, I think the former probably says more to the imagination. Zylarthen has the problem that people have to spell it correctly (I actually unintentionally spelled it wrong just now [with an "a"]) [Never name a server nebuchadnezzar - when people find it easier to remember the IP address you know you have problems.] Although it certainly is recognizable. Mostly you want a useful shorthand. SVZ is fine if you want your baggage routed to Venezuela (in particular the San Antonio airport). So my vote goes for 7VZ (or "seh-VEAZE"). "Seven Voyages" is my favorite, as it's the most evocative. I'm on board (see what I did there?) with Seven Voyages. 7VoZ is too wonky and Zylarthen you have to be able to spell. For the record, I really like the full name - it's unique and much more evocative than any of your initial ideas. You made the right decision! When I see 7VoZ i think 'Seven Vee Oh Zee' which is an awkward acronym. 7VoZ for writing but for speaking it is Zylarthen for sure! It just sounds super rad. Seven Voyages is definitely best, and easy to remember. #1 - I like simply Zylarthen overall (for both written and spoken contexts). I was going to say SVoZ for a written abbreviation, but then I Googled it - and saw how much random stuff comes up with that string of letters. (same thing with 7VoZ). Googling Zylarthen, it's all about your game. Not saying Google-ability is necessarily your primary concern, but it helps sometimes when discussing something and introducing new people to it. I like 7VoZ as well, but what about "Zeven Voyages" ? I like Option #1 (Zylarthen) the most; Option #2 (Seven Voyages) is a strong runner-up. Were I to say it aloud I would say Zylarthen. But for writing it I prefer Seven Voyages (although 7 Voyages works too but it's not my favorite). Zylarthen rolls off the tongue in an easy, pleasant way and sounds much more exotic and fantastic than the alternatives. It has a balanced look to it, as the 7 and the Z have similar slants. I tend to say ESS-VEE-oh-ZEE, and have been writing either SVZ or SVoZ, or Zylarthen. Hadn't thought about 7VoZ, 7VZ or 7v. I like the "Zylarthen" part of the name, so I feel like just "7v" misses a part of the name which I think is unique. Don't go with just "Seven Voyages", search results will have a LOT of bogus results. Definitely don't kill the project it scratches an itch. You need a slightly shorter version, and then a really lazy abbreviated version. 7VoZ is easy to type, but awkward to say (and yes, I actually do say "LotFP" sometimes...) SVoZ is easy to type and say. Also, 7VoZ looks like the name of a droid from Star Wars - could be a plus or minus. #5 Other. 7V is all you need it is unique, and easily recognizable by anyone who has any idea what you're talking about. Why complicate things simple and easy. Clean, simple meaningful and entirely in keeping with the one world titles "Blackmoor" and "Greyhawk"
I rather like this idea. Short, simple, and totally new and different. I'd pick it up from the games bin just to see what it was. Also, see my coomments below. Then again, I say things like Small Computer System Interface. Zylarthen would be my first choice, 7VoS as a second choice. 7VoZ works well as an abbreviated form. Zylarthen, is just so damn evocative. Agreed. When I think of 'Zylarthen' I become inspired. That sounds like I game begging for adventures to be written for. I've been calling it 7Z (seven-zee) in my head. That's 7Z (seven-zed) for our friends across the pond. Ooh, change my vote to "Seven-Zed"! "Seven Voyages makes me think of "The Seven Seas of Rhye"
7VoS. It just seems like the best. Otherwise, don't change a thing. I like "SVoZ" when giving a shortened title in writing; and "Seven Voyages" when speaking verbally of the game. As a wise man never said, "Don't abbreve." So I suppose my vote is 5. Other. "Seven Voyages of Zylarthen." 7VoZ is how I think of it.